Explanation: As far as ghosts go, Mirach's Ghost isn't really that scary. Mirach's Ghost is just a faint, fuzzy galaxy, well known to astronomers, that happens to be seen nearly along the line-of-sight to Mirach, a bright star. Centered in this star field, Mirach is also called Beta Andromedae. About 200 light-years distant, Mirach is a red giant star, cooler than the Sun but much larger and so intrinsically much brighter than our parent star. 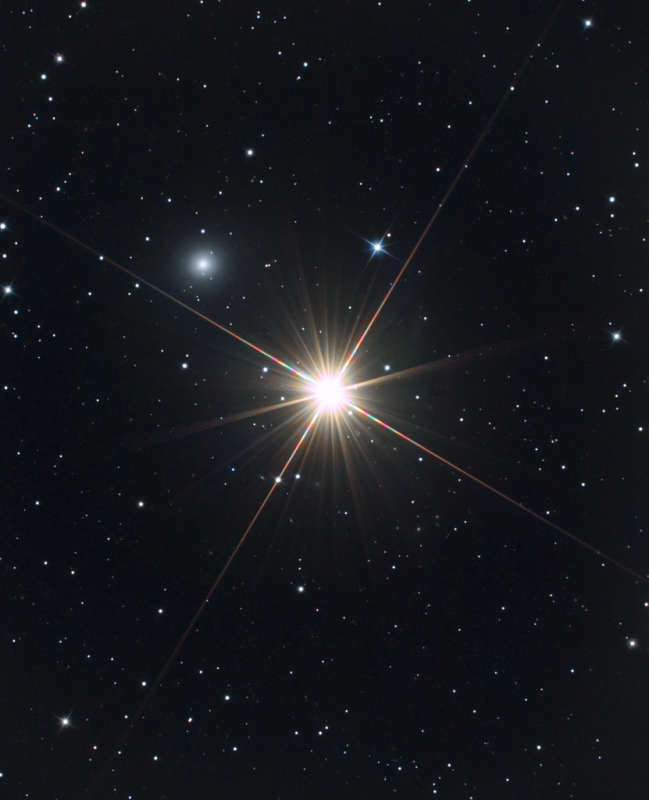 In most telescopic views, glare and diffraction spikes tend to hide things that lie near Mirach and make the faint, fuzzy galaxy look like a ghostly internal reflection of the almost overwhelming starlight. Still, appearing in this sharp image just above and to the left of Mirach, Mirach's Ghost is cataloged as galaxy NGC 404 and is estimated to be some 10 million light-years away.